Are Adaptive Selling, Customer-Orientated and Value-Based Selling distinct? The academic as well as practitioner-oriented literature propose a variety of different sales approaches which all have the target to improve sales effectiveness in personal selling and therefore increase revenue. These approaches often describe how a salesperson should behave, which skills and attitudes they should possess. Two well-known approaches in marketing science are Adaptive Selling and Customer-Oriented Selling. A third, relatively new approach is the so-called Value-Based Selling which aims at understanding the customer’s business model and thereafter highlighting the customer value during a sales discussion. Since all sales approaches have the same target, it seems intuitive that there might be correlation or an overlap within these approaches. Are Adaptive Selling, Customer-Oriented Selling and Value-Based Selling measured through semantically unambiguous scales? This research seeks to understand the conceptual relationship of the three constructs Adaptive Selling, Customer-Oriented Selling and Value-Based Selling. Furthermore, it seeks to examine if those constructs are distinct or if there is a construct identity problem, i.e., constructs that share semantically similar measurement items. Study with 51 undergraduate students. Two item sorting tasks were performed by the participants to understand semantic similarities and differences. In a laboratory study with 51 students this research investigates the face validity of the corresponding scales. Therefore, the participants were asked to perform two sorting tasks. Cards with all items intended to measure the three sales approach were shown to the participants. During the first sorting task, the participants were asked to sort the items into as many groups of their choice as they wanted. The three sales approaches were not introduced to the participants at this point of time. 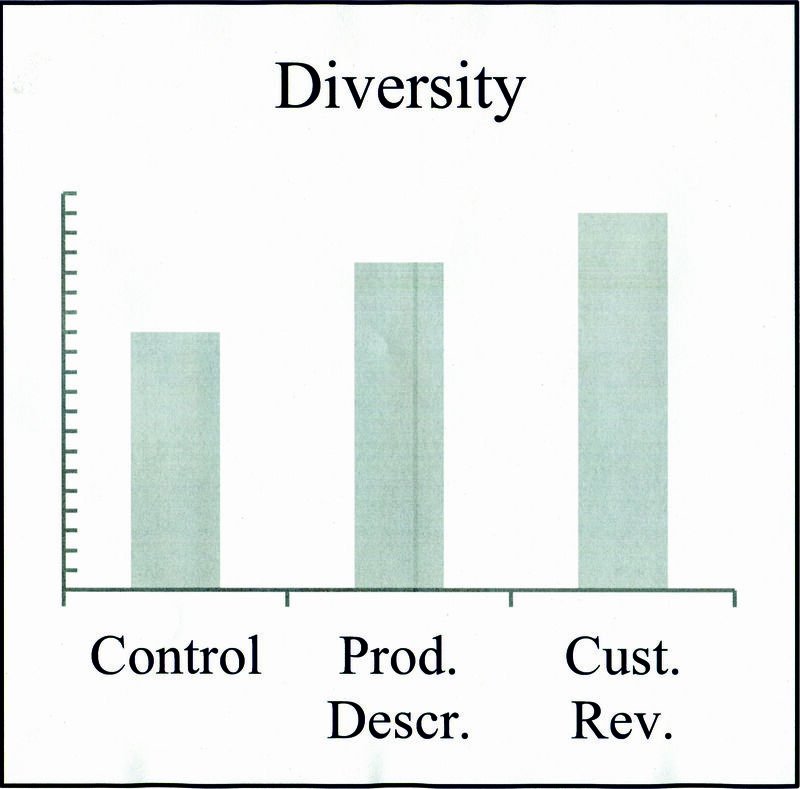 After the free sorting task, the three sales approach definitions were shown to the participants and they were asked to assign each item to one of the definitions. The theoretical part of this research shows that Adaptive Selling, Customer-Oriented Selling and Value-Based Selling indeed have a different contextual focus. Adaptive Selling mainly focuses on the adaptability of a salesperson towards a customer, whereas Customer-Oriented Selling and Value-Based Selling take into account that the salesperson should keep the customers’ interest in mind and point out how this can be achieved. Customer-Oriented Selling and Value-Based Selling have some face validity problems. Nevertheless, the sales approaches were not always perceived as distinct constructs in the laboratory study. Especially items of Customer-Oriented Selling (CO) and Value-Based Selling (VB) were often grouped together in the free sorting task. The results can be found in the figure below, which shows the frequencies the items were grouped together. If the scales were perfectly distinct from a semantical viewpoint, all entries related to two scales would be zero. For example, the CO-item 1 “I try to figure out a customer's needs” has been grouped together with the VB-item 1 “I work with my customers to find out what is needed to improve their performance” by nearly 50% of the participants on average. Even when begin provided with the constructs' definitions, the participants were not completely able to correctly assign every item to its corresponding sales approach. The results are shown on the figure on the right hand side. The results imply that the operationalization of the three approaches may not be perceived as completely distinct from each other, even though their conceptualization might be. Further research should examine the discriminant validity of these constructs. To solely rely on only one sales approach, for example during sales training, might not be useful. 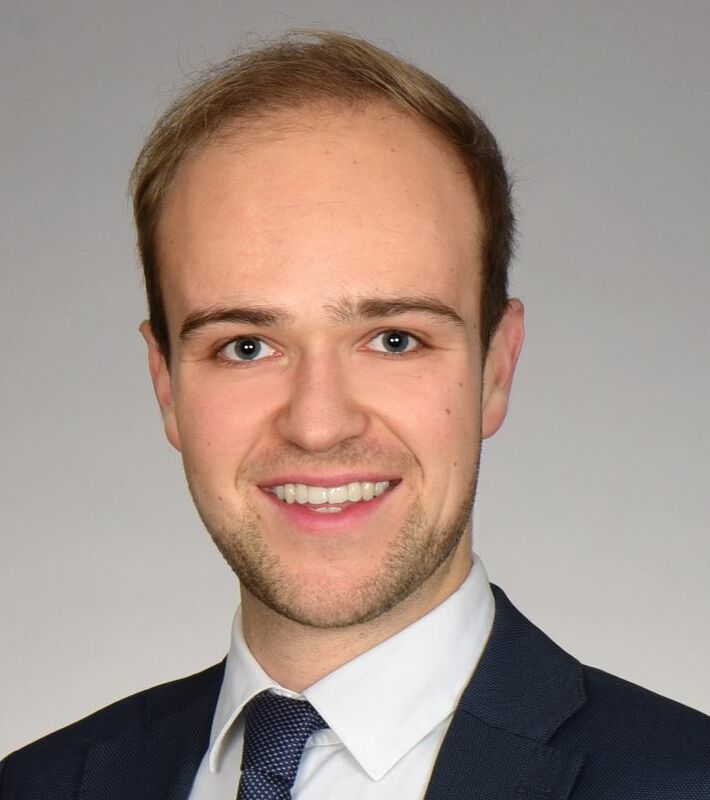 “Sales Approaches in Personal Selling - On the Relationship between Adaptive Selling, Customer-Oriented Selling and Value-Based Selling” (Schymroszczyk), bachelor thesis; email Maximilian Lüders if you want more information. Research Update #3: Are online customer reviews helpful for new product idea generation? The problem: Is it possible to use product descriptions or customer reviews to generate product ideas? Customer reviews are helpful for customers to decide which product to buy and therefore are powerful in influencing the decision to choose a product. However, there are also ways for companies to use them. At our Research Update #2 Tobias Roelen-Blasberg showed how product preferences can be measured by using customer reviews. This Research Update focuses on another way how to use them. We try to use customer reviews to generate ideas how to improve a certain product. Besides customer reviews also product descriptions are used. While product descriptions are published by retailers or producers to give potential customers some information about their products, customer reviews are written by customers of a specific product in order to provide some (ideally) unbiased information about the product of interest. As product for this study Fitness Trackers are used. The Top 45 unique products found on amazon.de are explored. A crawler was built to collect the customer reviews of these products. With this method over 11,500 reviews were collected. In the further process, information was aggregated by building word clouds (the word cloud based on customer reviews is displayed in the following). 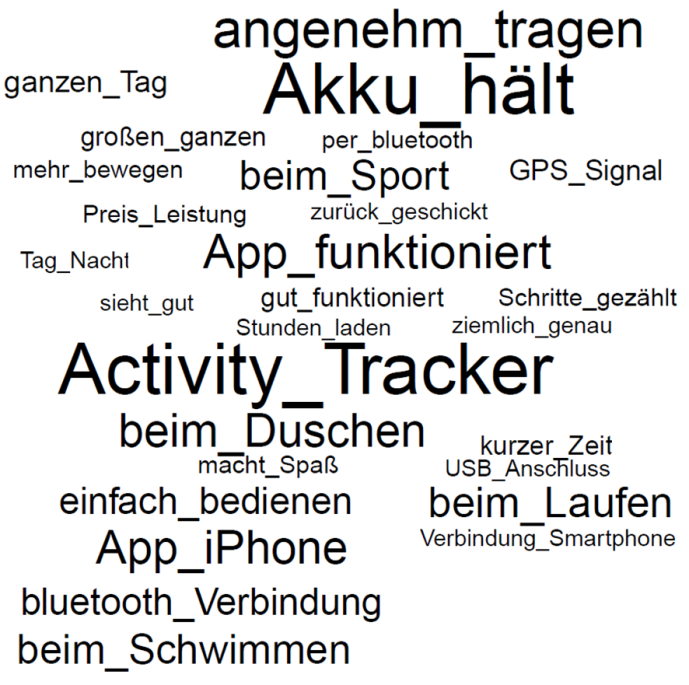 Participants of the study got either word clouds that consist of product descriptions or customer reviews and were advised to develop ideas how to improve Fitness Trackers. To better compare those results also a control group was used that had neither of that information. With this method 600 ideas were generated. Ideas were rated by 1,000 raters. Each rater assessed 12 ideas. Overall every idea was rated around 20 times in the categories novelty, value, feasibility, elaboration and market potential. Results show that it is not possible to generate better ideas with the use of customer reviews. Mean scores in the rated categories and overall between ideas that are generated with customer reviews, product descriptions or without them did not differ. Furthermore, the diversity of the ideas was assessed. It can be seen that the usage of word clouds leads to a higher diversity of ideas. In addition the most diverse selection of ideas can be generated with the help of customer reviews. This means it is not possible to generate better ideas with this approach but it is possible to generate a larger amount of diverse ideas. The overall highest rated idea of the experiment was to use thin solar cells on the surface of the Fitness Tracker to make it independent from external energy sources. Email Ingo Halbauer if you want more information. The problem: How to gain market knowledge more efficiently? “What do my customers think about my product right now?” is a typical question of companies. Today, this information is usually gained through consumer surveys or interviews, which are complex to set up, time-consuming and expensive. Most companies do not collect the data itself, but hire external market research agencies that gather the insights from the consumers. Typically, these kinds of studies are performed very rarely (once or twice a year), which is why they are often outdated for decision-making. To answer common questions like “Has the last advertising campaign influenced how customers perceive my brand?” would require a series of studies that were conducted at least twice, before and after the campaign execution. Consequently, strategic decisions heavily rely on gut feelings and marketers struggle to demonstrate the value that has been created by their marketing activities. Today, most companies do not monitor continuously how their brands are perceived by the customers, because traditional market research is to complex, time-consuming and expensive. The enormous and exponentially growing corpus of social media incorporates customer opinions about brands and products in form of product reviews (e.g. on Amazon or YouTube) or in conversations of customers (e.g. in forums like Reddit or in social networks like Facebook or Twitter). This raw data creates an opportunity for marketing research to mine customer preferences continuously. This research investigates if this online data can be leveraged to track the customer mindset by identifying what aspects customers love or hate about a product. These aspects can be functional like the screen resolution of a smartphone or non-functional like the taste of a beer. Ideally, these insights are extracted fully automated, which means no human interaction is required throughout the entire analysis. This research tries to gain knowledge about the customer mindset from a fully automated approach that analyzes large corpora of consumer reviews. We applied and compared a set of Machine Learning, Natural Language Processing and Text Mining approaches on our large textual datasets (more than 600,000 reviews in total) of six different product categories (ranging from high-involvement categories like smartphones to basic products like toothpaste or laundry detergent). We identified most important product attributes within each text corpus by automatically looking for patterns in human language that express opinions about aspects and group terms to meaningful attribute clusters. Based on this information, machine learning classifiers were trained and used to identify attributes in new texts. To evaluate the results of the automated approach, we conducted two comparative studies with a US consumer panel to elicit stated preferences in a traditional way via online surveys. In total, more than 2,000 consumers were surveyed to derive two comparative datasets. Most-important product attributes were successfully mined without any human interaction. According to the consumer surveys, our approach identified the most important product attribute successfully for all investigated categories. Especially state-of-the-art grouping algorithms improved the results by automatically identifying domain-specific synonyms (like “taste” and “flavor” or “aroma” and “smell” in beer reviews) from the text itself. In addition, our approach learns positive and negative statements towards each aspect, without any human interaction, which can help marketers to understand how positively or negatively the aspects of their products (and even of their competitors’) are perceived by customers. Classical sentiment analysis often fails to extract the correct sentiment if domain-specific words like “high” were used, which can express a positive opinion about one thing (e.g. the screen resolution of a smartphone) and something negative in another context (e.g. the error rate of a smartphone). Our approach captures the context of the opinion to predict the sentiment more accurate. The results are finally aggregated on a product-level to derive strength and weaknesses of products in customer perceptions. From a dynamic web application, marketers gain a continuous and data-driven picture of the whole market and can even drill into the analysis of single attributes. 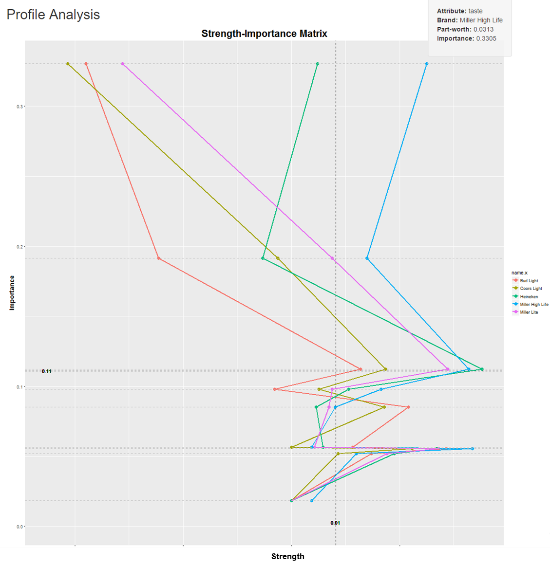 The figure shows one chart of the web application that analyses 5 beer brands. 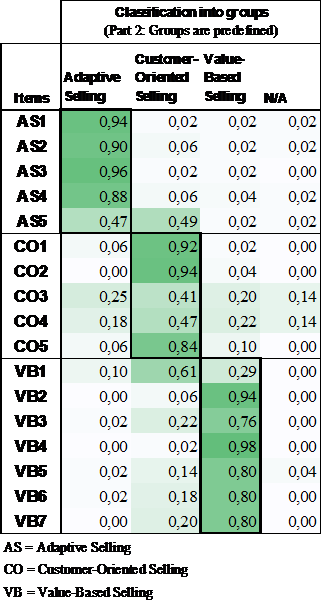 The vertical axis describes the importance of the attributes (e.g. “taste”) and the horizontal axis describes how positively the attribute is perceived by the customers. “Leveraging User-Generated Content to Automate Preference Measurement” (Roelen-Blasberg and Klarmann); email Tobias Roelen-Blasberg if you want more information. The problem : How to develop a good pricing strategy for innovations? At the recent IFA 2017 in Berlin, Miele presented the new Miele Dialog Oven. This is not a regular oven, but a revolutionary new cooking method that uses electromagnetic waves to “communicate” in a smart way with the texture of food. What is a good price for a radical innovation like this? A wrong pricing strategy for an innovation may put all the investments into research and development at stake. At the same time, most managers will agree that there’s not much that is more complex than developing a pricing strategy for an innovation, especially for a radical innovation. Before the market launch, Miele needed to develop a pricing strategy for a product that’s launched in a largely untested market, with high degrees of uncertainty as to how consumers and competitors may react, and where traditional pricing decision rules do not apply. In reality many pricing decisions for radical innovations are based on gut feelings. For complex strategic tasks like this, the traditional literature has an advice for decision-makers: Carefully consider all alternatives based on all relevant cost, company and customer information you can get, and make a rational decision. In reality however, many pricing decisions for radical innovations are based on “gut feelings” and “hunches.” In his book “The Everything Store” Brad Stone describes that when pricing Amazon’s Web Services, Jeff Bezos went against his team’s suggestions and “unilaterally revised” (i.e., lowered by a third) the proposed prices for Amazon’s Web Services. Amazon Web Services are undoubtedly a great success. This research seeks to understand when intuition works and when it doesn’t. This research seeks to understand when intuition works and when it doesn’t. We used a commercial manager panel to survey 231 managers about the decision-making process with regard to one pricing strategy for an innovation in which they were involved. The managers responded to questions regarding the level of product innovativeness and about the extent of rationality and intuition that was applied during the pricing strategy development task. Finally, subjects indicated how effective the pricing strategy was with regard to the innovation’s financial performance. Yes, a rational style of information processing helps to make a pricing strategy for an innovation effective. But intriguingly, so does an intuitive style – but only when the focal innovation is radical (just like Amazon’s Web Services or the Miele dialog oven). 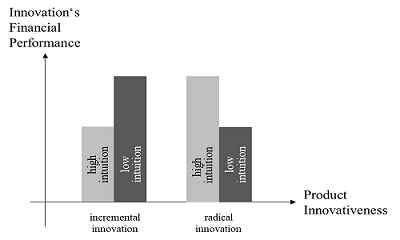 When the innovation is incremental (i.e., merely an improvement of an established product), low intuition outperforms high intuition. The figure below depicts this effect pattern in a simplified manner. To interpret this result, it is important to understand that intuition has nothing to do with guessing or flipping a coin: Intuition integrates all information sub-consciously and produces a strong feeling to choose one particular alternative over the others. In fact, all managers in the sample had a high job experience and where hence able to make intuition-based decisions. For a radical innovation and in the light of high uncertainty and ambiguous market information, intuition should not be discredited by managers leading pricing teams. Rather, managers should encouraged intuition for radical innovations but complement this form of information-processing with elements of rational decision making. Reversely, managers should curb the use of intuition for very incremental innovations or me-too products and rely solely on rationality in the decision-making process. Just for the record, Miele set the launch price for its Dialog Oven to be 7.990 Euro. “How pricing teams develop pricing strategies for new products” (Feurer, Schuhmacher, and Kuester, manuscript submitted to the Journal of Product Innovation Management); email Sven Feurer if you want more information.